Can you see it? The faded portions on this cone of 8/2 cotton. This will serve as a horrible warning that no matter how appealing a convenient window ledge is in your busy studio, don't leave your yarn sitting there. This was just a week sitting there with the sun not shifting to this side of the house until 3 pm or so, plus a generous eave overhang on the house. So what does hanging laundry to dry outside do? Whites only from now on! I have a clothes drying rack that I can tuck well back under cover. My title says it all for this post! Time has just slipped away on me and we find ourselves rather busy around house, yard and new town. When we moved in October 1st, we went straight into months of rain and snow and so much was left 'as is'. So there has been much wrangling of stuff in the garage, garden sheds resulting in yet more stuff to donate, sell, or dispose of. I have embarked on some deep cleaning projects such as windows (with walls and doors to come). Working away in and around the frames with my handy dandy tooth brush brings out dirt, debris (such as dead bug bits) and bring back the inner frames back to the white vinyl and clean screens too. They are so much easier to open now! Anyway.... you get the idea of what's been happening around here. We have had delightful tea breaks with our new neighbours on the west side of us and got to know them better. They moved in just a couple of months ahead of us. Also taking some days off entirely to drive around and get to know the area better. Sometimes just sitting watching the waves roll in at the beach. Your reward for being patient ( hopefully you haven't given up on me entirely) is the beauty shot right at the start. 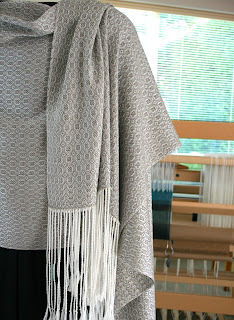 This is the second shawl off the 10/2 white tencel warp, and same little 12 shaft point twill pattern. This time I used a 55% / 45% silk yak blend from Treenway Silks as my weft. Its a 30/2 in size so quite fine. It has the loveliest silvery-beige natural colour and picked out the pattern nicely but not loudly. Its a chameleon as the light changes, so does the colour! I watched my friend Gudrun sit and sketch this draft out quickly. All the pattern is in the tie up, so its easy threading and treadling. 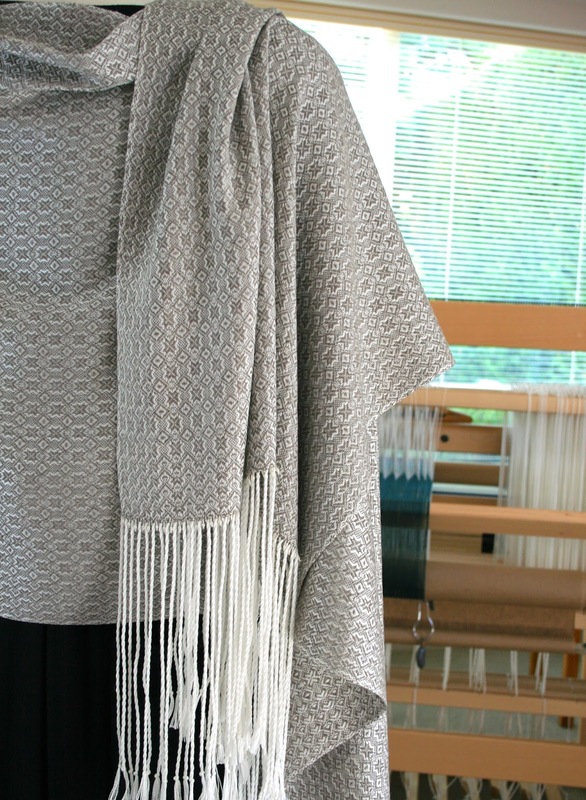 It has a lovely drape and is as soft as a cloud. I decided to add some seed beads and tiny pearl accents along the fell lines. The fresh water pearls are 2-2.5 mm in length, all with perfect tiny holes right through. I buy them from this Etsy shop. 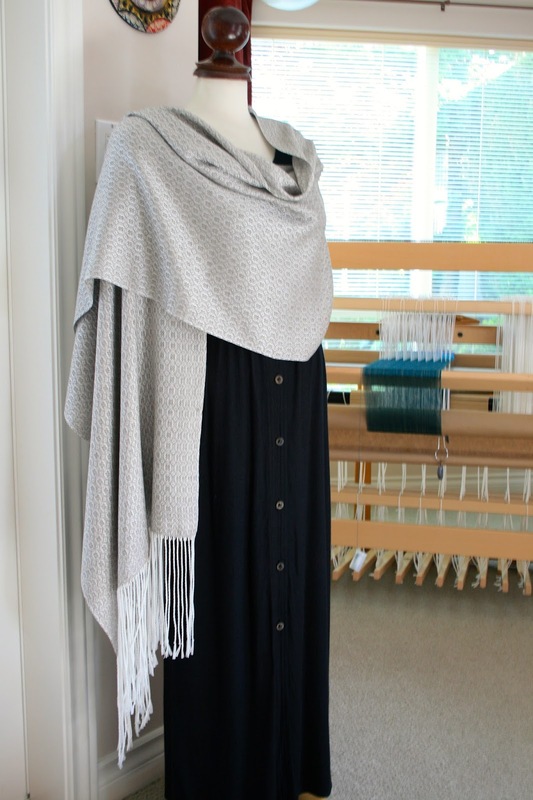 As I worked at twisting the (seemingly never ending) fringe and later hand sewing on the beads / pearls, I came to realize that I simply could not sell this shawl. I'm going to keep it. I have nothing suitable to wear with it, and not sure where I would wear it, but I'm ready if the event comes up in my social calendar! My next realization is that in 20+ years of weaving I have only kept a cream silk M's and O's scarf for me..... and a whole lot of seconds for kitchen towels and table runners for the home. But they were for the household and not me per say. So, normally I have my standard loom waste allowance, a few inches for samples and another allowance for take up.... plus the lengths of the items to be woven and it all works out fine. So imagine my surprise when I wound the shawl onto the cloth beam, including its fringe allotment. and could see and feel there was much more warp on the warp beam! So no samples this time and lets see if I can get a nice table square! 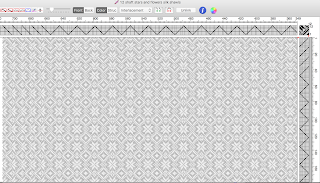 I chose a light silver 10/2 tencel as its fairly neutral for any decor and should weave up 50/50 (or close to it). As an aside, our house plants love all the light and sunshine in this house and all are growing well. 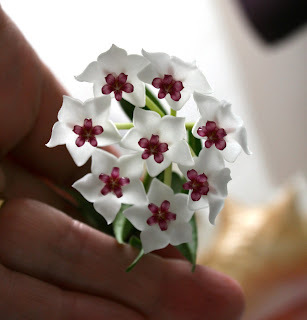 So imagine my surprise when my little hoya plant gifted to me by my late friend Gudrun in 2013 when we visited *finally* produced flower buds on all its few little stems! It produces a light fragrance that smells like you could eat it and its stronger at night. This is the first bunch to open up. The flower clusters hang face down so you only see the tops of the heads but underneath they are so pretty! So what's ahead? Well, in the pictures above you probably noticed the teal warp on the loom. 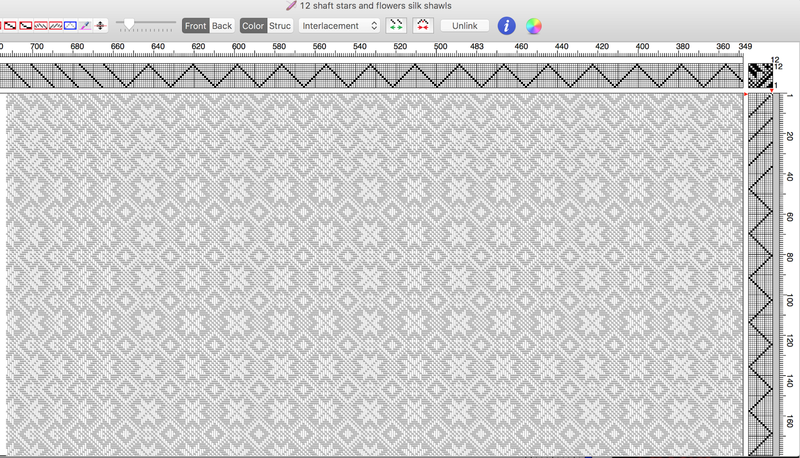 That's for two scarves in this same pattern and then as you can imagine, I will be thoroughly sick and tired of this draft. (It seemed like a good idea at the time.) I'm well into weaving scarf number two. Then time to move on to something new. I have two client commissions to weave so one of those will be next. Time to get the warping mill busy.